The surge in volatility might be more than just an isolated event, it could be a harbinger of what might come next. Think back a long time ago to a market far, far away. Two Bear Stearns funds go bust. That was a harbinger of a financial crisis a year-and-a-half later. We might see a few like that with regard to firms that were heavily trading volatility. The whole “sell vol” trade completely imploded the past week. While I saw it coming, I underestimated the exposure of some. 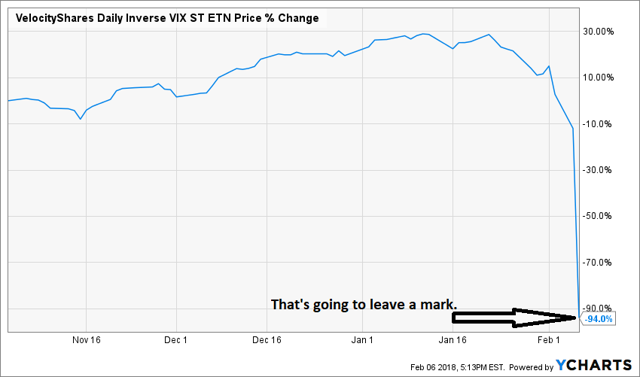 I wish I had held my calls on the iPath S&P 500 VIX Short-term Futures ETN (VXX) just a couple days longer. That would have been the difference between doing between doubling and tripling money and hitting a three week 10-bagger. Oh well. Credit Suisse (CS) has decided to shut that fund down in the next two weeks. They’ll be taking a charge of north of $300 million it looks like, as owner of about 1/3 of the shares of the formerly billion dollar plus fund just a few weeks ago. That won’t break them, but it’ll sting. And, it could materially change the behavior of a big institution, then again, maybe not, sometimes they have to be on the morphine drip to repent. Nomura (NMR) also announced the closing of a similar product: “we apologise from the bottom of our hearts for causing great inconvenience for the holders”. Ha! Inconveniently helped you lose all of your money except bus fare. But hey, thanks for the fees the past several years, our bonuses were great. The demise of XIV has surely taken some daytraders down with them. But that’s just the tip of the iceberg. Of course, many folks were not using XIV, they were using futures instead. The biggest traders of volatility are funds that rebalance stocks and bonds on a regular basis. When volatility goes up, those firms trading volatility, generally need to sell stocks. What does that mean? Futures require margin, which means a margin call – tomorrow! Somebody is not going to survive. Oh, that’s not all. Some firms going down would be fine, but there is a very real risk to the stock market having a flood of forced selling in the next few days as those volatility traders are forced to rebalance their portfolios and try to make the margin calls. The business of “hedging” portfolio positions has largely gone by the wayside as “confident” (I’m being diplomatic there) traders make their trades naked, expecting they’ll be right or close enough to right that they can’t get blown up. Well, guess what? BOOM!!! Now, all those trades without protection just required a kevlar vest. The shot from this could be a very big deal. “Although the precise timing is difficult to ascertain, we estimate that these funds will need to sell around $225 billion worth of equities over the next few days…” said Barclays. That’s huge amount of stock selling in case you didn’t know. The stock market nosed up to the 10% correction level Tuesday, it could break well through that in the next few days. “The first trade to capitalize on volatility is to simply sell cash-secured puts on the iPath S&P 500 VIX ST Futures ETN (VXX). With not only the price, but actual measured volatility sitting at record lows, selling puts is a way to capture premium and if the contract is put to you, then you have a very cheap asset to hold for a month or two. Sell VXX February $25 puts for about $1.50. When entering the trade, ask for the “ask” price. Then over an hour or so, lower to the big price, which will get filled. If you get a $1.50, that yields a 6% return on your cash in about 6 weeks – not bad. If the put gets put to you and you end of up owning VXX with a net cost of around $23.50, then you have to manage the position. I would be inclined to be willing to hold it even if it slides to a slight loss because the odds of a volatility pop are so high. Remember, volatility pops a lot when it pops, so seeing VXX shoot to $50 for a week isn’t that weird. Because of the possibility that volatility could surge, the second part of this trade is to buy calls on VXX if the price does in fact fall to about that $25 area. If I can buy the VXX June $25 calls for under $5 sometime later this month or in February, I’d be very inclined to wager on a spring pop in volatility – see reasons above, particularly Fed balance sheet which is a known. So, the follow up trade is to buy VXX June $25 calls for under $5, preferrably as close to $2.50 as possible. We’ll have to play it by ear, but this is a two part trade, selling the cash-secured puts and then buying calls if time without volatility lengthens and prices continue to decrease. We went on to make some adjustments, but as members hopefully chime in below, those who had the experience to do this made triple digit gains in under a month. Now, I’m not claiming anything supernatural here, only that knowing volatility was about to rise was possible. There was evidence which I didn’t completely share here, but subscribers got the lay out of catalysts I saw. Of course, none of the catalysts could have manifested, but that just means volatility rising became more likely in the future and somebody else could have made similar trades. I waited years to make those trades though, so I wasn’t one of those breathy “bubble callers” of the past nine years. There are other things that are mostly knowable. Things we can accurately say, even if precise timing is hard or impossible. To be sure, the timing of this trade was very hard and I avoided it a long time because it was too hard. 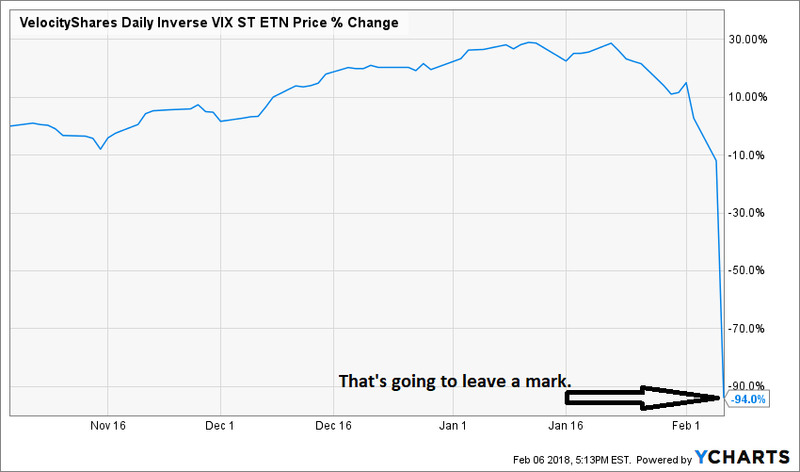 One thing that appears knowable is that there is a chance, a chance that is growing, that this correction has some legs to it. Do I foress a financial collapse. No. This is not nearly as pervasive as the mortgage crisis. This too shall pass. But I do challenge you as an individual investor to ask yourself this question: Are you sure you are listening to the right people? If you’re listening to people who say they don’t know anything and keep saying “don’t sell, just ride it out…” then I ask you: how did you handle 2008-09? I ask that because another financial crisis will happen eventually. And, it will be seeable. There will be signs. That doesn’t mean we can catch it perfectly, but we can be warned and maybe seek some “just in time” shelter. Think about that. It’s important to you financial security and standard of living. Well, the first thing to do is not rush into buying or selling anything at this point. You need to see what is happening in the markets in coming days. You need to be unemotional and think like a sniper. Look for your shots. I have been telling subscribers to be 25% cash or more – depending on their situation – since autumn. I’m now putting together a stock list to focus on derived from our “Very Short List” of 100 stocks that could lead in the next decade. If you are not heavy on cash, I’d suggest “selling the rips,” that is, paring back your equity asset allocation by selling some of your less certain investments. It’s okay to be down a little, don’t let it turn into a lot. Accumulate some dry powder, there will be targets in this changing world from technology to energy to consumer discretionary leaders and more. We already have several ETF trades we are looking to make. If you have been reading me, then you know I like the PowerShares QQQ (QQQ) at certain price levels. That price isn’t here yet, but it could be soon. If you are interested in learning more, since this is my birthday month, I have decided to offer a two week free trial to Margin of Safety Investing and a discounted rate to February subscribers. Take a look at the landing page and think about joining us. We have a great developing community of over 100 members, including some very knowledgeable people in various industries. Join the group and share your expertise on topics you know about. It’s a Peter Lynch thing. You’ll see me quote him and that guy in Omaha a lot.